It was very nice meeting many moms at last Saturday’s Living with Eczema book launch. Both Professor Hugo and I shared, and in case you’re worried you missed something important from Prof Hugo’s talk, here are the salient points! 1. As the child ages, the type of eczema may change (for instance, from atopic dermatitis to contact dermatitis – saliva, ingredients in skincare products) and the triggers change too (an older child is more likely to be allergic to house dust mites). 4. Reduce contact with allergens in the air, including eggs which are present in food court and non-circulating air. Egg protein is airborne, small and light – can even be in our dust and our mattress. 5. Recommendation to adopt an outdoor lifestyle to reduce contact with indoor allergen. 6. Untreated eczema can lead to infection, particularly with scratching. Infected eczema after healing leads to dark scars which are permanent. Scratch lesions which persist will also reduce pigment cells, thus leading to skin discoloration. (See also eczema complications series, where many complications arise due to scratching/infection). 7. Eczema has a genetic component – 25% if both parents don’t have eczema, 60% if mom has eczema, 50% if dad has eczema. 8. In terms of food allergens in Singapore, egg is the most common, followed by milk, soy and wheat. 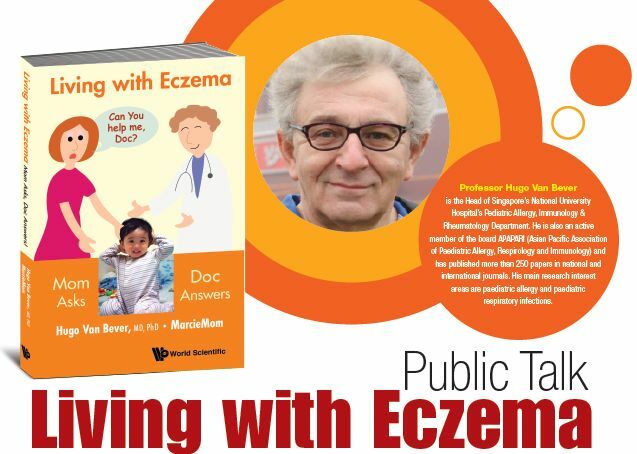 There is much more that is shared in the book Living with Eczema: Mom Asks, Doc Answers, watch this video to see what it covers. Furthermore, from now till 8 May 2015, Prof Hugo and I will answer any question you have from reading the book on GooglePlus, read here to find out how!